On this page you can find out how to run a bath fan exhaust through the brick wall. If you want to know the easiest and fastest professional way of doing that, do yourself a favor and get the information for a discount price. 24. Bath Fans Installation – the chapter gives a brief description of two types bath fan installation. On 07.31.2011 text of this chapter was significantly modified and improved. 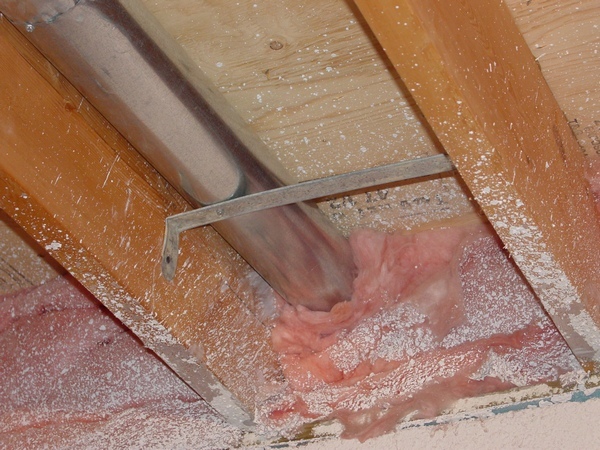 There are several ways how to terminate a bath fan exhaust that is runnig in the attic, and one of them is a termination on the roof. For the last 20 or so years, the bath fans have been set in the building code and if your house not much older than that most likely that you have a bath fan in every bathroom. Of course, it is very important to have them. You can find a lot of information about how important to have them in your house, such as: “Moisture can be a problem in the bathroom. It can cause paint to peel, doors to warp and the accumulation of mold spores. A simple exhaust fan can greatly reduce or eliminate the many problems created by excess moisture”. However, believe me nobody tells you that through the bath fan you loose a lot of the conditioned air! Several years ago, I looked at the soffit cap, where the bath fan exhaust was terminated, and saw a couple of icicles hanging down! I knew that that bath fan never has been running because it located in the laundry room. I walked around the house and found that there are the same icicles on the other soffit caps. Therefore, I have decided to save some energy and of course money and put pieces of paper between the unit cover and the casing of the fan. However, I have not blocked the air completely to prevent the motor from overheating if I or somebody else in my family turns the fan on. Of course, this energy saving tip is not for everyone. If you spend hours in the bathtub, or very smell sensitive you need the bath fan running in the full strength, otherwise this energy saving tip can significantly increase your furnace idle cycle. 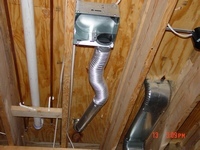 Below you can learn how to install bath fan in your basement or in your attic. If you would like to read more, please use the “BuyNow” button below and you will gain an in instant access to the sixth chapter of my book dedicated to the energy conservation issues! In the chapter you will learn how to save energy with your bathfans and how to install a new one. The chapter has 9 page and 37 picture in it. Price of the chapter is only $2.50. After you have purchased a paid page; PayPal is going to bring you back to my website. In order to see the paid page you have to click on the “Register” button, fill out the form, choose your own Username and Password and click on the “Register” button at the bottom of the form – congratulation, you are on the page you have paid for!